McCormack: Luton board were told, don’t you sell our best players! 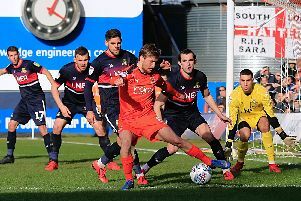 Midfielder Alan McCormack joked that Luton Town chief executive Gary Sweet had been warned by the players not to sell any of the club’s stars during the January transfer window. With the Hatters in a wonderful position at the top of the table, the worry among some supporters had been that the likes of talented full back pairing James Justin and Jack Stacey could be snapped up, with former West Ham attacker Elliot Lee also said to be attracting interest. We didn’t want to lose anybody and they will get there, they will eventually get there. McCormack did think that staying put wouldn’t hurt any of the hot commodities that Luton currently possess. He continued: “You want to see players go on to big clubs and do things, but we’re playing so well at the moment, and these three, four, five players that keep getting mentioned each transfer window, are integral parts of this team. “We didn’t want to lose anybody and they will get there, they will eventually get there. “As they’re still performing, even after the moves have happened and then not happened, then been very close to happening. “A lot of players could go downhill from that and mentally be broken, but they haven’t. Meanwhile, McCormack, 35, knows he has an important role to play off the field as well as on it during the run-in, ensuring Town’s youngsters keep their heads. He added: “I think it’s natural with people as they get older. “When you see young players coming in and they may worry about a little thing, when you’ve been there, and you’ve seen it, you can say, ‘don’t worry about it, it’s absolutely nothing, as it’s going to happen again. So football constantly evolves in circles, you will have a bad game and you will have a great game the next week, so it’s great to be around and still feeling as young as the young boys. “That’s what keeps me on my toes, and that’s what makes me feel I’m still in my 20s.